The magazine cover indicator is a great contrarian sentiment measure because once a topic has reached massive public penetration and put on the front cover of a magazine, the trend is about to finish. But once in a while we get conflicting covers. And in such a case, the question then is, which one is right? which one do we fade? 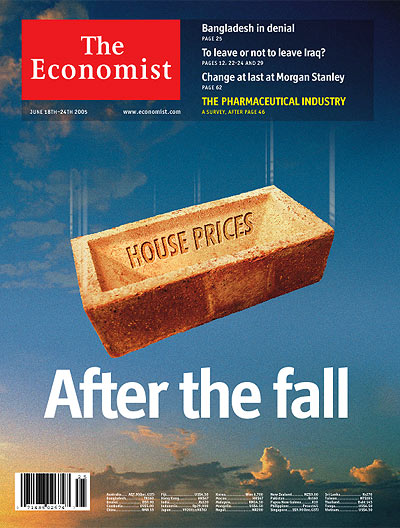 The symbolism of the brick in free fall left no doubt what stance The Economist was taking on this issue. Although housing prices were going up like there was no tomorrow, the Economist was asking about what would happen after the inevitable fall. 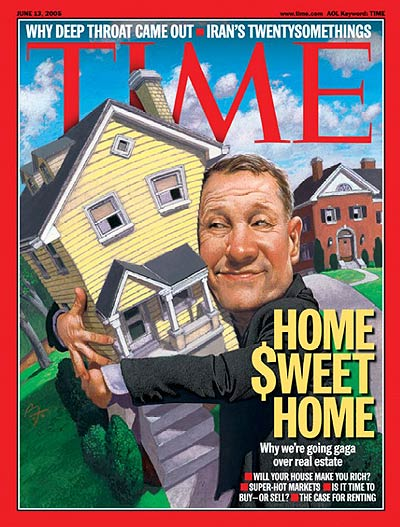 Now contrast that with the cover on Time showing a man happily squeezing a house in a bear hug. Note the $ instead of “S”weet and the taglines: We’re going gaga over real estate, Will your house make you rich?, Super hot markets, It is time to buy-or sell?, The case for renting. Source: InvesTech’s Housing Index is proprietary composite of the most sensitive stocks in the housing sector. So which one of those covers should you have listened to? Obviously The Economist. I myself tried in vain to point out the danger of such a hyper-inflated bubble to a relative who was heavily invested in European real estate. I was given a laundry list of why the argument in the Economist article didn’t matter or was wrong. Not because one magazine is inherently better but because one magazine (Time) is geared to a more general audience while the other (The Economist) is targeting a very discerning readership. Plus, if you had read both articles, you couldn’t have noticed that Time’s was simply “fluff” while the Economist one was bursting at the seams with data and more data. My point is this: to get a really good contrarian cover indicator, look for the most general audience publisher. Don’t go for specialty publications. 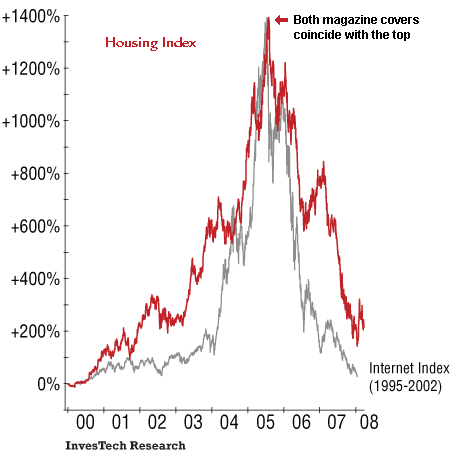 The increasing importance of house prices in the world economy prompted The Economist to start publishing a set of global house-price indices in 2002 (see article). These now cover 20 countries, using data from lending institutions, estate agents and national statistics. Our latest quarterly update shows that home prices continue to rise by 10% or more in half of the countries America has seen one of the biggest increases in house-price inflation over the past year, with the average price of homes jumping by 12.5% in the year to the first quarter. In California, Florida, Nevada. Hawaii, Maryland and Washington, DC, they soared by more than 20%. compared with a year ago as both sellers and buyers have lost confidence in house valuations. House-price inflation has also slowed significantly in Ireland, the Netherlands and New Zealand over the past year. any previous boom. (The glaring exceptions are Germany and Japan, where prices have been falling.) American prices have risen by less than those in Britain, yet this is still by far the biggest boom in American history, with real gains more than three times bigger than in previous housing booms in the 1970s or the 1980s. previous peaks, from which prices typically fell in real terms. House prices are also at record levels in relation to incomes in these nine countries. America’s ratio of prices to rents is 35% above its average level during 1975-2000 By the same gauge, property is “overvalued” by 50% or more in Britain, Australia and Spain. Rental yields have fallen to well below current mortgage rates, making it impossible for many landlords to make money. A common objection to this analysis is that low interest rates make buying a home cheaper and so justify higher prices in relation to rents. But this argument is incorrectly based on nominal, not real, interest rates and so ignores the impact of inflation in eroding the real burden of mortgage debt. If real interest rates are permanently lower, this could indeed justify higher prices in relation to rents or income. For example, real rates in Ireland and Spain were reduced significantly by these countries’ membership of Europe’s single currency—though not by enough to explain all of the surge in house prices. But in America and Britain, real after-tax interest rates are not especially low by historical standards. America’s housing market heated up later than those in other countries, such as Britain and Australia, but it is now looking more and more similar. Even the Federal Reserve is at last starting to fret about what is happening. Prices are being driven by speculative demand. A study by the National Association of Realtors (NAR) found that 23% of all American houses bought in 2004 were for investment, not owner-occupation. Another 13% were bought as second homes. Investors are prepared to buy houses they will rent out at a loss, just because they think prices will keep rising—the very definition of a financial bubble. “Flippers” buy and sell new properties even before they are built in the hope of a large gain. In Miami, as many as half of the original buyers resell new apartments in this way. Many properties change hands two or three times before somebody finally moves in. mortgages in those states with the biggest price rises. will be forced to accept lower prices. five years, several countries are likely to experience price falls of 20% or more. While America’s housing market is still red hot, others—in Britain, Australia and the Netherlands—have already cooled What lessons might they offer the United States? yet home prices have fallen. The Federal Reserve’s gradual increase in rates by two percentage-points over the past year has done little to scare away buyers, because most still have fixed-rate mortgages and long-term bond yields have remained unusually low. But as more Americans have been resorting to ARMs, so the housing market is becoming more vulnerable to rising rates. in Britain could not keep up with demand. But as the expectation of rising prices has faded, demand has slumped. According to RICS, the stock of houses for sale has increased by one-third over the past year. America has faster population growth than Britain, but its supply of housing has also been rising rapidly. Economists at Goldman Sachs point out that residential investment is at a 40-year high in America, yet the number of households is growing at its slowest pace for 40 years. This will create excess supply. (first published on the eve of the stock market collapse in 2000), disagrees. He estimates that house prices in America rose by an annual average of only 0.4% in real terms between 1890 and 2004. And if the current boom is stripped out of the figures, along with the period after the second world war when the government offered subsidies for returning soldiers, artificially inflating prices, real house prices have been flat or falling most of the time. Another sobering warning is that after British house prices fell in the early 1990s, it took at least a decade before they returned to their previous peak, after adjusting for inflation. Housing-equity withdrawal has also fallen sharply over the past year in Britain and Australia, denting household spending. In Australia, the 12-month rate of growth in retail sales has slowed from 8% to only 1.8% over the past year; GDP growth has halved to 1.9%. In Britain, too, a cooling of the housing market has been accompanied by an abrupt slowdown in consumer spending. If, as seems likely, home prices continue to fall in both countries, spending will be further squeezed. Even a modest weakening of house prices in America would hurt consumer spending, because homeowners have been cashing out their capital gains at a record pace. Goldman Sachs estimates that total housing-equity withdrawal rose to 7.4% of personal disposable income in 2004. If prices stop rising, this “income” from capital gains will vanish. 30% on average (the fall in nominal prices was smaller). All but one of those housing busts led to a recession, with GDP after three years falling to an average of 8% below its previous growth trend. America was the only country to avoid a boom and bust during that period. This time it looks likely to join the club. over the past ten years in most of the countries that have experienced housing booms. And it is surely no coincidence that Japan and Germany, the two countries where house prices have fallen for most of the past decade, have had the weakest growth in consumer spending of all developed economies over that period. Americans who believe that house prices can only go up and pose no risk to their economy would be well advised to look overseas.